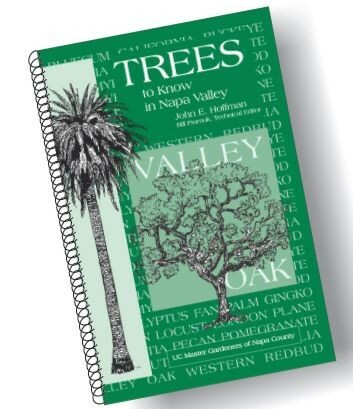 Revised and updated, t his 148-page, spiral-bound book includes four foldout maps featuring walking tours of Fuller Park and Old Town Napa, as well as a driving map of Napa's Significant trees. The book also includes an extensive chart of 220 different trees, updated articles on individual tree species by John Hoffman and new articles by Bill Pramuk. John E. Hoffman was a local arborist and a UC Master Gardener of Napa County volunteer until his death in 2010. Technical Editor Bill Pramuk, a consulting arborist based in the Napa Valley, is Tree Risk Assessment Qualified, a long-time columnist for the Napa Valley Register and teaches a class in arborculture at Napa Valley Adult Education. These Books Make GREAT GIFTS ! This is a book that every local gardener must have, written by UC Master Gardeners of Napa County for local conditions, and at $12.00 it is a bargain. 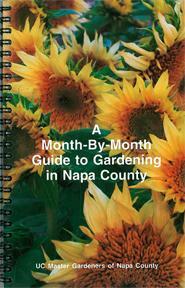 It presents simple and easy to understand garden information month by month for Napa County, with soil managment, planting, harvest and a checklist for each month. Additionally, there are discussions of our climate zones (both from Sunset Western Garden Book and from the U.S.D.A) our soil types, mulching, and compost and more.